Officials with the Seacoast Science Center in Rye said the male juvenile minke whale was found floating Sunday around the Isles of Shoals. It washed ashore on Jenness Beach Monday morning. The 16-foot long whale, which weighed about two tons, had entanglement wounds, but officials with the Seacoast Science Center and National Oceanic and Atmospheric Administration (NOAA) needed to remove it for a necropsy. 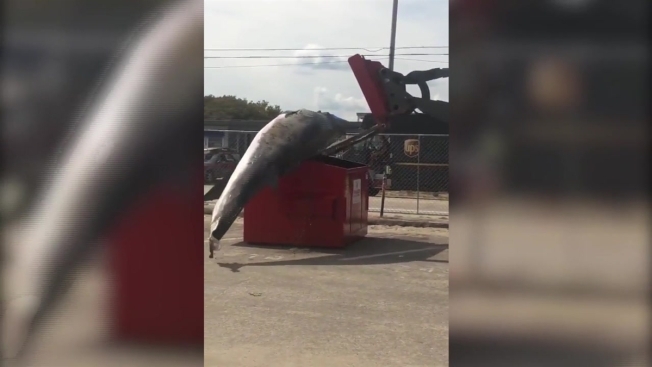 While removing it, crews initially used a backhoe and tried placing it in a dumpster but the dumpster proved to be too small and the deceased whale was seen on video falling out. Officials were working on finding something bigger in order to transport the animal off the beach. NOAA Fisheries spokesperson Jennifer Goebel told Seacoastonline.com that from South Carolina to Maine, 27 minke whales were found dead in 2017 and another 16 washed up dead this year.